Which DHCPv4 message will a client send to accept an IPv4 address that is offered by a DHCP server? A company uses DHCP servers to dynamically assign IPv4 addresses to employee workstations. The address lease duration is set as 5 days. An employee returns to the office after an absence of one week. When the employee boots the workstation, it sends a message to obtain an IP address. Which Layer 2 and Layer 3 destination addresses will the message contain? Which is a DHCPv4 address allocation method that assigns IPv4 addresses for a limited lease period? Which address does a DHCPv4 server target when sending a DHCPOFFER message to a client that makes an address request? As a DHCPv4 client lease is about to expire, what is the message that the client sends the DHCP server? What is an advantage of configuring a Cisco router as a relay agent? It will allow DHCPDISCOVER messages to pass without alteration. It can forward both broadcast and multicast messages on behalf of clients. It can provide relay services for multiple UDP services. It reduces the response time from a DHCP server. What is the administrator trying to achieve? The router is intended to be used as a SOHO gateway. The administrator needs the router to act as a relay agent. The router is meant to provide IP addresses to the hosts. This is an ISP requirement. The router has a fixed IP address. A network administrator configures a router to send RA messages with M flag as 0 and O flag as 1. Which statement describes the effect of this configuration when a PC tries to configure its IPv6 address? It should contact a DHCPv6 server for all the information that it needs. It should use the information that is contained in the RA message exclusively. It should use the information that is contained in the RA message and contact a DHCPv6 server for additional information. It should contact a DHCPv6 server for the prefix, the prefix-length information, and an interface ID that is both random and unique. A company implements the stateless DHCPv6 method for configuring IPv6 addresses on employee workstations. After a workstation receives messages from multiple DHCPv6 servers to indicate their availability for DHCPv6 service, which message does it send to a server for configuration information? How does an IPv6 client ensure that it has a unique address after it configures its IPv6 address using the SLAAC allocation method? It sends an ARP message with the IPv6 address as the destination IPv6 address. It checks with the IPv6 address database that is hosted by the SLAAC server. It contacts the DHCPv6 server via a special formed ICMPv6 message. It sends an ICMPv6 Neighbor Solicitation message with the IPv6 address as the target IPv6 address. Refer to the exhibit. Based on the output that is shown, what kind of IPv6 addressing is being configured? Refer to the exhibit. What should be done to allow PC-A to receive an IPv6 address from the DHCPv6 server? Add the ipv6 dhcp relay command to interface Fa0/0. Configure the ipv6 nd managed-config-flag command on interface Fa0/1. Change the ipv6 nd managed-config-flag command to ipv6 nd other-config-flag. 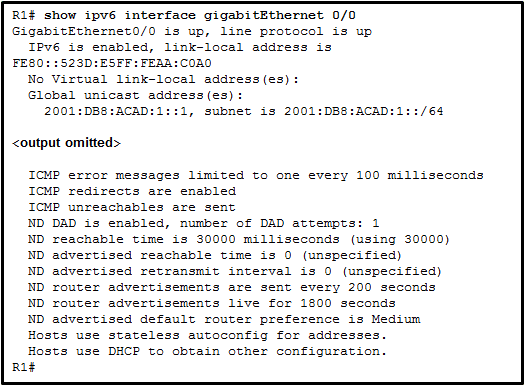 Add the IPv6 address 2001:DB8:1234:5678::10/64 to the interface configuration of the DHCPv6 server. Refer to the exhibit. A network administrator is implementing stateful DHCPv6 operation for the company. However, the clients are not using the prefix and prefix-length information that is configured in the DHCP pool. The administrator issues a show ipv6 interface command. What could be the cause of the problem? No virtual link-local address is configured. The Duplicate Address Detection feature is disabled. The router is configured for SLAAC DHCPv6 operation. The router is configured for stateless DHCPv6 operation. Refer to the exhibit. A network administrator is implementing the stateless DHCPv6 operation for the company. Clients are configuring IPv6 addresses as expected. However, the clients are not getting the DNS server address and the domain name information configured in the DHCP pool. What could be the cause of the problem? The GigabitEthernet interface is not activated. The router is configured for SLAAC operation. The DNS server address is not on the same network as the clients are on. The clients cannot communicate with the DHCPv6 server, evidenced by the number of active clients being 0. Fill in the blank. Do not abbreviate. 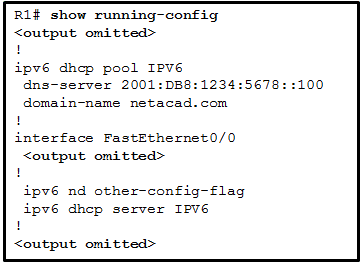 Type a command to exclude the first fifteen useable IP addresses from a DHCPv4 address pool of the network 10.0.15.0/24. Define the default gateway router.